Chinese politics from the provinces: Another Fad That Fades--Or Gets Ridden Out Of Town? Another Fad That Fades--Or Gets Ridden Out Of Town? A brief word or twelve about the new bike-sharing programs that have debuted in a number of Chinese cities in recent months, including some in Jiangsu. There’s been a lot of interesting analysis that’s been done on these initiatives, at least from a macro perspective. 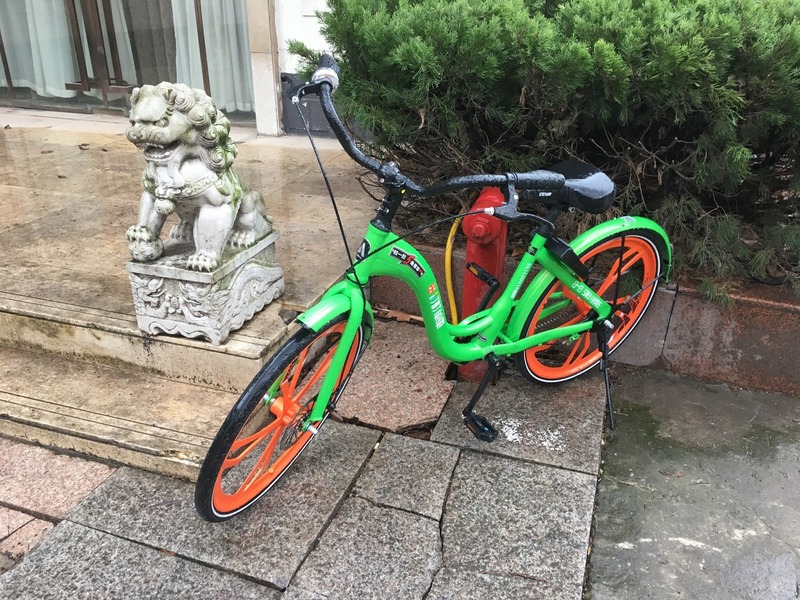 Mobike, Ofo, and a number of other brands are seen as vying for customers to get out of their cars and back in touch with the bike-reading heritage of the Middle Kingdom. Perhaps that’s the view from Beijing and Shanghai, and maybe there’s merit in that analysis for those cities. But the vast majority of China’s people live elsewhere. And here in the provinces, the situation is just as complex as it’s always been and may well ever be. First, these are good bikes that Mobike and Ofo are providing: they’re handsome and well-kept, and they’re pretty much everywhere. 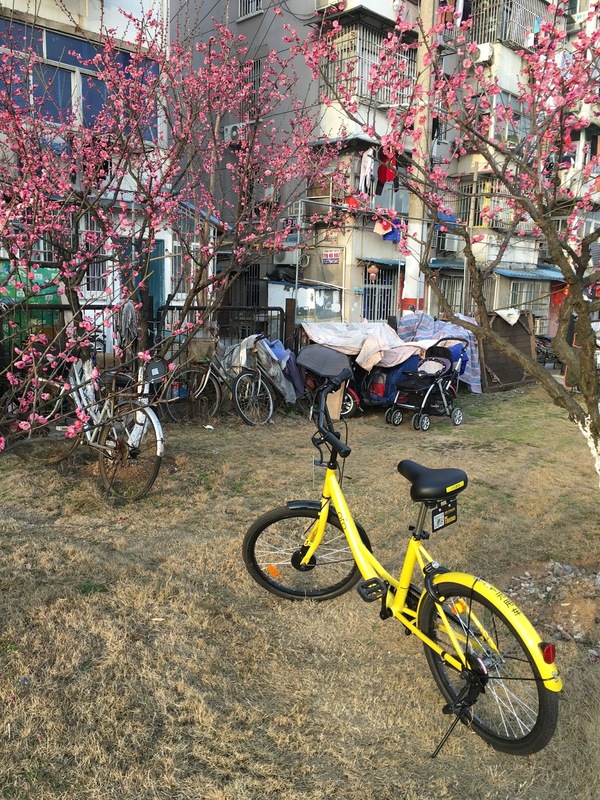 But then again, so are the bikes being offered by the city of Nanjing in partnership with other quasi-private firms. The problem with the latter has been the payment system: instead of apps, prospective riders were supposed to use their public transportation cards to swipe. Except they couldn’t: Nanjing teamed up with a firm (or created one as a front company—it happens all the time here in Local China) that decided it wanted its own card used to collect fees on. That situation is now said to have been remedied, but in some parts of the city, the problem persists. 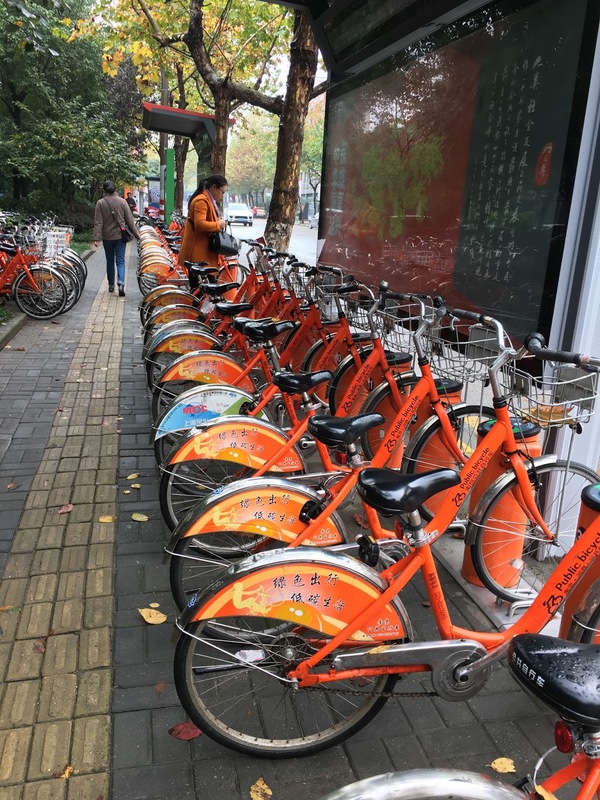 Nanjing has invested a lot of money and attention to the city-wide project of providing bikes to residents, but it’s under challenge from Mobike, Ofo and others because riders want to use apps on their cellphones. Another problem for Nanjing at least is that their bikes have to be left at designated stations. The vast majority of residents here do that; but some don’t, and that’s created a problem of retrieval, as well as theft (particularly by itinerant labor in the city, some of whom can’t believe their good fortune of being able to swipe a card and swipe a bike to take back to the countryside at the same time). 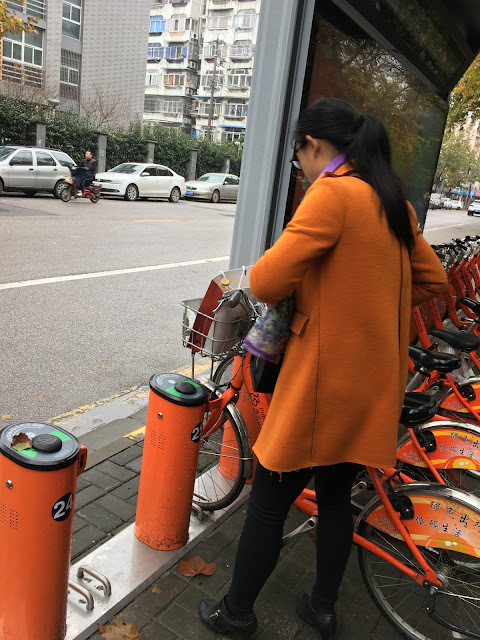 Nanjing has established a plethora of new sites, but some customers start riding the bikes, find their dietary habits (especially cigarettes) don’t allow them to go very far, give up after less than a kilometer or two, and leave the bike anywhere they find convenient for themselves. The irresponsibility that pervades Chinese society rears its ugly front wheel in this case. The bike-sharing options offered by various start-up firms are seen by many riders as more attractive and—well, cool. One often sees young people riding these bikes, pausing to take a selfie, and then pedaling on. It’s also common to see young couples putting their child on the bike for a photo, and then getting back to their walk (or, in more than one instance, walking downstairs into the car park). Perhaps in many instances there’s a destination, but it’s clear that for some users, it’s just something to experiment with and post about. Whether riding public bikes will be incorporated into their daily lives is open to question, especially as these are early days for all where these ventures are concerned. Of more local concern is where to park these sorts of bikes. An emerging problem is riders using bicycles to go to lunch or dinner here, and leaving them in front of restaurants, blocking sidewalks as well as entrances to adjoining shops. Already there are reports in larger cities of users leaving ride-sharing bicycles in authorized locations and city authorities impounding them. As much as some observers want to frame this issue (as with so many others here) as about consumers and citizens and how they’re changing China, the bike-sharing initiative will come down to how the State reacts. 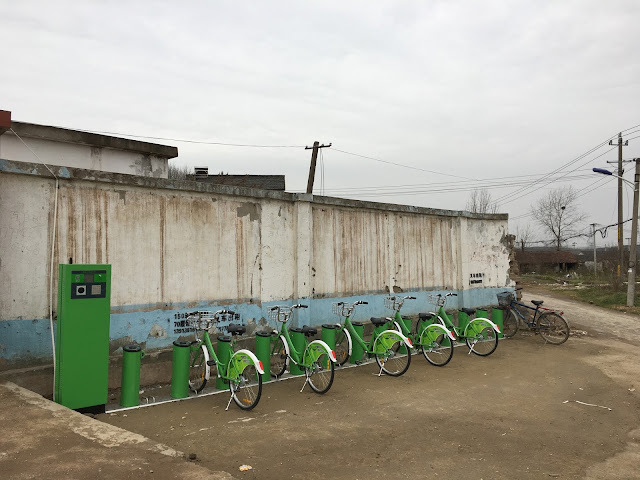 One can easily see local authorities that have invested millions of RMB in their own public bicycle infrastructure deciding to launch campaigns to purge private competitors in the name of cleaning up the streets. Like many matters that seem new in Local China, this one may get rather old—and reminiscent of former times—rather fast.